An MBK Dopero kite of every type, featured in Flight Reports. An MBK Dopero kite can take a little fiddling around with bridle knots before it returns its best flights. But the effort is worth it, since the 4-point bridle helps to keep this design in shape over a wide range of wind speeds. And it excels in very light wind. 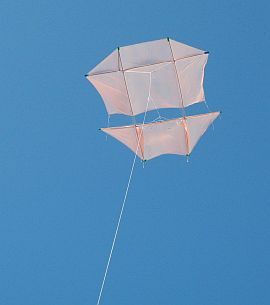 Very large Doperos can be used for Kite Aerial Photography in light winds, when other designs would fail to stay up at all. 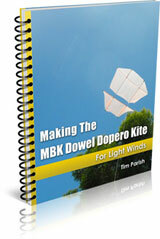 Making The MBK Dowel Dopero Kite is a handy e-book of printable step-by-step instructions. It's a PDF file download. It's often been a surprise seeing how steep the Dopero can fly, considering that compared to other MBK Dowel designs it has quite a bit more wood in the frame. Despite that extra weight, the flat central portions of the upper and lower sails make for one efficient flying machine! With 6 year-old Aren at soccer practice for 45 minutes, and a gusty breeze tickling the tree tops, it was a chance to pull out the Dowel Dopero. This kite has had a good break from flying, so I had a quick check of all the tape spar caps, after rigging. The ones on the lower horizontal spar were a little suspect, but would hold up for a while. I hoped. The next 20 minutes or so were spent with short flights, walking out to bring the kite down, re-adjusting the upper bridle loop, and re-launching. After about 3 tries, the Dopero flew straight and true. This kite responds very predictably to the knot position. Knot right, turns to the right, and vice versa. Given the limited time available for flying, it was sensible to stay under a 60 meter (200 feet) line length. The air was rough up there, causing the normally sedate kite to twitch its tail and accelerate upwards suddenly from time to time. Five turns of line around a smooth-barked sapling was enough to hold the strain, as the MBK Dopero kite held a high line angle in the cool breeze. The efficiency of this design is just amazing. No thermal activity to speak of, and yet it kept bobbing up to high angles, pulling like a horse. A check of the Windtronic meter showed an average wind strength of just 1.4 kph and a peak gust to 3.6 kph. However, there was a dense row of pine trees upwind. The clouds moving overhead indicated moderate strength winds higher up. So did the very taut flying line!